Jack Gillespie had hit game-winners before, but they didn’t exactly count. Tuesday night at Norristown, nothing could compete with the real thing. 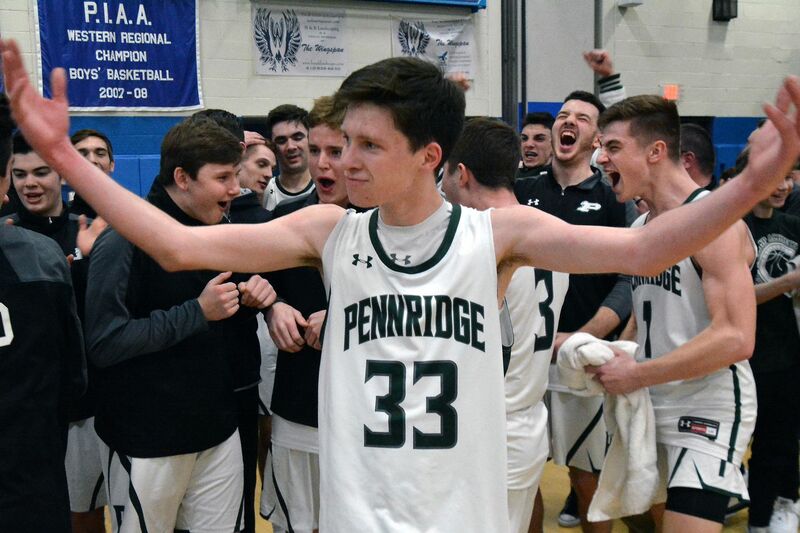 Gillespie’s late three-pointer propelled Pennridge past La Salle, 52-47, in the PIAA Class 6A semifinals, and earned the Rams a trip to the program’s first state championship game. After he laughed, his father, Jack (different middle names), politely asked to pause his son’s first interview, grabbed his son, squeezed him tightly and said, “I love you so much!" It must feel even better considering Gillespie had mostly logged junior varsity minutes until this season. Pennridge's Trent Fisher (23) grabs a rebound in front of Lincoln's Oluwadara Idowu during a PIAA Class 6A first-round playoff game at South Philadelphia High School on Saturday, March 9, 2019. Pennridge won 49-45. Gillespie’s three-pointer from the right corner, just in front of the Rams’ bench, went straight in, barely grazing the rim along the way, giving Pennridge a 50-47 edge after La Salle’s furious charge late. Senior guard John Dominic led the Rams (27-5) with 15 points. He also had the game-winning assist to Gillespie. Senior guard Sean Yoder, a Naval Academy recruit, finished with 13 points, four rebounds and four assists. Senior Jon Post and junior Trent Fisher added toughness, tenacity and eight and seven points, respectively. Both teams played an efficient, team-based brand of offensive basketball, passing often, moving without the ball and rarely breaking into individual play. The District 12 No.4-seeded Explorers (26-4) finished with 13 assists on 17 made field goals. La Salle finished 17 of 39 overall, 8 of 20 from 3 and 5 of 8 from the foul line. The Rams, District 1’s No. 4 seed, had 11 assists and finished 21 of 39 overall with 8 of 17 coming from 3 and 2 of 3 at the foul line. La Salle, which was led by senior Princeton recruit Konrad Kiszka’s 15 points, trailed, 24-22, at intermission and fell behind further, 45-36, early in the fourth. Key senior reserve Emmanuel Freyre, however, helped the Explorers’ defense force several turnovers that eventually resulted in an 11-2 run that tied the game at 47 with 53 seconds left. The tie was a result of a Titus Beard steal along the sideline near halfcourt. Pennridge's Jonathan Post (44) and Luke Yoder (1) embrace after their PIAA Class 6A first-round playoff game against Lincoln at South Philadelphia High School in South Philadelphia on Saturday, March 9, 2019. Pennridge won 49-45. Beard slapped the ball toward senior guard Allen Powell, who tossed the ball ahead to Kiszka, who capped the break with a two-handed dunk. Powell finished with 14 points, 11 of which game at halftime. After a timeout, La Salle, still in a trap extended past halfcourt, doubled-teamed Sean Yoder just ahead of halfcourt, leaving the rest of the defense in scramble-mode, which led to an open Gillespie. That corner-pocket, he said, is among his favorite practice spots every day. His first attempt from three in the first half on the left wing missed badly, but Gillespie wasn’t deterred, and neither were his teammates. LS: Konrad Kiszka 15, Allen Powell 14, Jake Timby 8, Zach Crisler 3, Titus Beard 4, Jack Rothenberg 3. P: Sean Yoder 13, Luke Yoder 3, Jon Post 8, John Dominic 15, Trent Fisher 7, Jack Gillespie 6.